I'm a physician living in Connecticut. My interest in astronomy dates back to my childhood in New York where I made frequent visits to the famous Hayden Planetarium. I remember keenly the great feelings of excitement and discovery when gazing at the magnificent astrophotographs produced by the large observatories of those days. 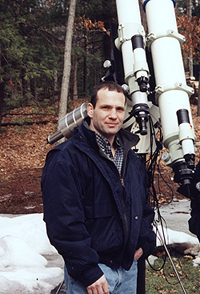 Astronomy and especially astrophotography remained little more than a dream until I moved from New York City to Connecticut in 1993. After taking an introductory course in astronomy at a local college I purchased a pair of binoculars and spent the next year and a half learning the night sky. I then purchased my first telescope, a 10" dobsonian with which I spent the next year observing many deep sky objects whenever the weather permitted. I have many pleasant memories of my early experiences using that telescope. I remember the great feeling of accomplishment and pride upon finding distant galaxies in the eyepiece. This was surely exciting but deep down I yearned to take images like the ones I looked at in amazement earlier in my life. My next purchase was a significant step forward. In 1996 I bought a 10" Schmidt Cassegrain and a CCD camera. This equipment gave me my start in astroimaging. My first images of distant galaxies and nebulae were of only mediocre quality but encouraged me to go forward with color CCD imaging. I continued to work on and improve my techniques. From that point on I would say I was hooked on taking astroimages. My equipment evolved to apochromatic refractors and later to a Ritchey-Chretien cassegrain. Early in my imaging days I was inspired by the great professional astrophotographer David Malin and by the early black and white images taken with the 200" at Mt Palomar. I was also greatly impressed with the aesthetic images being produced by amateurs with more modest equipment. Images taken by Bill McLaughlin, Al Kelly, Adrian Catterall, Stan Moore and others demonstrated to me that the CCD along with digital enhancement techniques could be used to produce images rivaling film in aesthetic quality but with superior resolution and contrast. The CCD is indeed a versatile and powerful imaging instrument. My imaging style evolved in part from studying both film and CCD images taken by many of the great imagers practicing today. What I try to achieve is a balance of smoothness and richness in color, coupled with the best resolution and contrast I can acquire using my equipment. This requires careful attention to detail and very long cumulative exposures (often several hours for a given object). My routine is to devote an entire night (or sometimes several nights) to imaging a single object. In this way I can acquire the large amount of data needed to compose a high quality color image. My favorite part of the process is watching the image come to life on the computer screen as I assemble the multitude of individual frames taken during the previous nights session. Although well known for its scientific value, astronomical imaging also has great educational and artistic value. The fascinating natural forms and colors of galaxies, nebulas, and other deepsky objects are deeply aesthetic and have inspired many to learn more about our universe. As an art form, recording the natural wonders of the night sky is deeply rewarding and inspiring. For over ten years I imaged from my driveway adjacent to my home. I was lucky to be living on a dark cul de sac although there was always the problem of worsening light pollution which made quality imaging increasingly difficult. In the spring of 2005 an opportunity arose to image remotely from a dark sky site in New Mexico at a place owned and operated by Mike and Lynn Rice called New Mexico Skies. I took this wonderful opportunity and haven't looked back. In 2007 New Mexico Skies opened an affiliated remote imaging station in Western Australia which provided me a wonderful opportunity to image the gems of the southern sky. Astrophotography has evolved to become a valid and significant art form in its own right. The rigors of celestial imaging are less well known. The physical and technical demands are great. Equipment is costly and experience comes only at the expense of sleep and comfort. It requires a substantial commitment but pays back in huge rewards. I can tell you it has enriched my life. I enthusiastically recommend it to anyone with an interest in the areas of astronomy, imaging, or computer science as astroimaging is a marriage of these disciplines. Just a word of caution; after your first successful image be prepared to be hooked for life!